Pagkatapos maghain ng reklamong libel at grave slander, pinasimulan ng celebrity stylist na si Liz Uy ang #StopTheHate post sa Instagram. Kalaunan, nag-post na rin ng kahalintulad na mensahe ang iba pang mga artista kung saan isa raw itong mensahe laban sa cyberbullying. 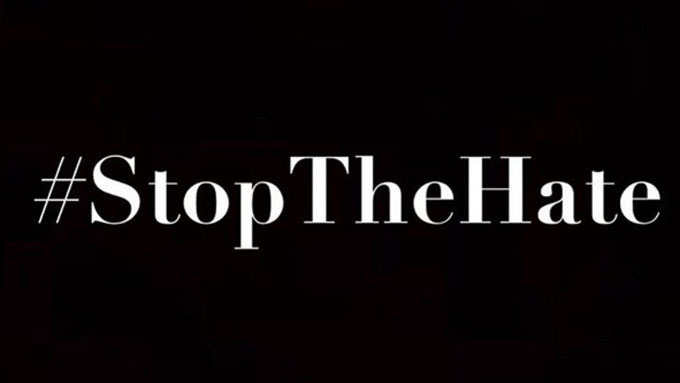 Pinag-uusapan ngayon sa social media, lalo na sa photo-sharing site na Instagram, ang #StopTheHate posts. Sinimulan ito ng celebrity stylist na si Liz Uy. May kaugnayan ito sa reklamong inihain niya laban sa blogger na si Michael Sy Lim ng Fashion Pulis. Nag-post si Liz ng simpleng #StopTheHate photo sa kanyang Instagram account pagkatapos niyang maghain ng 11-million online libel, grave slander complaints laban sa naturang blogger. Sabi ni Liz sa caption: “As a former fashion editor, I was trained to uphold FAIR and RESPONSIBLE journalism at all times. "When I transitioned into celebrity styling and accidentally became a public figure myself, I learned to embrace that being scrutinized by the public is part and parcel of that position. "However, sometimes things can be taken too far and place me in a bad light, discrediting my hard work, my team, and my styling company. I am not the first victim—many others have chosen to remain silent. "I could have done the same, but in the end, I realized that if we always let him get away with cyber bullying, then he will continue to propagate untruthful claims and malicious gossip on his blog and social media accounts. "Thank you to everyone who has expressed their support. I am fighting this battle not just for myself, but for every single person—celebrity and otherwise—who has been bashed relentlessly and unfairly. #StopTheHate"
NO TO CYBER BULLYING. Kasunod ng post na ito ni Liz, sunud-sunod na rin ang pag-post ng kanyang mga kaibigan at ilan pang artista tungkol sa #StopTheHate campaign bilang pagsuporta sa kanya. Anne Curtis: “In this time and age where everyone is so passionate about "freedom of speech" people seem to have forgotten the difference between freedom of speech and cyber bullying. I stand with @lizzzuy as she makes a statement #StopTheHate"
Raymond Gutierrez: "Supporting @lizzzuy all the way in her fight against cyber-bullying and online responsibility! Don't put others down to bring yourself up. Let's do this! Team Liz! #StopTheHate ðŸ‘ŠðŸ¼ðŸ‘ŠðŸ¼ðŸ‘ŠðŸ¼"
Bea Alonzo: "Stop cyber bullying!!! âŒ @lizzzuy"
Isabelle Daza: "To support @lizzzuy I will stand by her as I have witnessed these rumors being spread with my very own eyes and ears. Doing "your job" by trying to bring down someone else's reputation is just wrong! Let's #StopTheHate." Georgina Wilson: “Today I am proud of one of my best friends @lizzzuy for standing up for an issue that has gone ignored for far too long. As public figures we know that criticism comes with the job but that doesnt give anyone the right to constantly cyber bully and post hate perpetuating false stories. I have personally been victimized by this blog's malicious reporting and bashing as I'm sure many others have and it is time that we all take a stance and bring awareness to this unethical and negligent reporting. Be responsible with what you post and what you support online. #stopthehate NOW. Nadine Lustre: "Lets all be responsible. No nega! â¤ï¸ #StopTheHate"
Andi Eigenmann: “Yes. We should never let anybody's hate, drama, and negativity stop us from being the best person we can be. But won't the world become a much better place if we just didnt have any of them at all? Ive been a victim of cyberbullying one too many times. I never bothered, because I know myself better, and the people that love me too. But it doesnt make this OK. Only love stops hate. Lets change our world. #STOPTHEHATE"
Heart Evangelista: “Finally! it's all too much #notocyberbullying I think as celebrities also it's our responsibility to teach or fans not to fight back but spread positivity...its normal to feel bad and sometimes answer back but at the end of the day the best way is to do what is right...â¤ï¸ #stopthehate"
Divine Lee: "#StopTheHate spread the love nalang guys â¤ï¸â¤ï¸â¤ï¸ Sa love tayo, Lizarda! @lizzzuy"
Paulo Avelino: “Posting this in support of fair and responsible journalism and ethical behavior online. #StopTheHate"
"To all my Little Ponies and Vicerylle babies: Thanks for trying to be responsible netizens as much as you can. Never resort to bashing. Marami na tayong nasaktan at marami na ring nakasakit satin. Let's spread Good Vibes na lang para clap clap clap Champion! #StopTheHate"